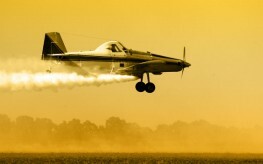 What a surprise – the U.S. Department of Agriculture (USDA) plans to make a decision to fully deregulate Dow Chemical’s Enlist corn and soybeans, genetically engineered to be repeatedly sprayed with the herbicide 2,4-D and glyphosate. When does this agency ever choose to protect our food supply? Now, the Center for Food Safety (CFS) is condemning this action, though it isn’t much different from all the other ridiculous actions the USDA and FDA usually make. 2,4-D (2,4-dichlorophenoxyacetic acid), produced by Dow Chemical, was once a chemical combination used in Agent Orange, which was heavily sprayed in Vietnam. Unfortuantely, 2,4-D and other herbicides are in a class of toxins which cause deadly immune system cancers, Parkinson’s disease, endocrine disruption, and reproductive problems. The only reason to use this group of chemicals as at all is because Monsanto’s RoundUp is basically ineffective on its own. It is no longer controlling weeds, and farmers who once counted on RoundUp are now growing more weeds than edible crops. Instead of first generation GE crops becoming immune to RoundUp, the weeds have. Experts already agree that way too much glyphosate has been sprayed around the world on every conceivable crop – GMO and non-GMO. And though Dow claims 2,4-D crops are the solution to weed resistance, a recent peer-reviewed study published in the prestigious journal Bioscience concludes that these new GE crops will instead pour oil on the fire by triggering still more intractable weeds resistant to both glyphosate and 2,4-D. Even the USDA reports without any seeming concern that the approval of 2,4-D resistant corn and soybeans will lead to an unprecedented 7 fold increase in spraying of 2,4-D chemicals by 2020, and this will be compounded with the glyphosate and RoundUp chemicals already heavily in use. As much as 176 millions lbs of 2,4-D will be in use per year. That doesn’t sound very safe, for anyone or anything. Are they trying to grow crops, or freakish plants and poison people?